Zoo Animals: Husbandry, Welfare and Public Interactions begins by suggesting that maintaining biologically functional and compatible social groups is a primary welfare concern for zoo-housed animals. An overview of the welfare impact of social groupings of a number of zoo-housed animals is presented, and the extent to which zoos are able to cater for individual species needs is discussed. 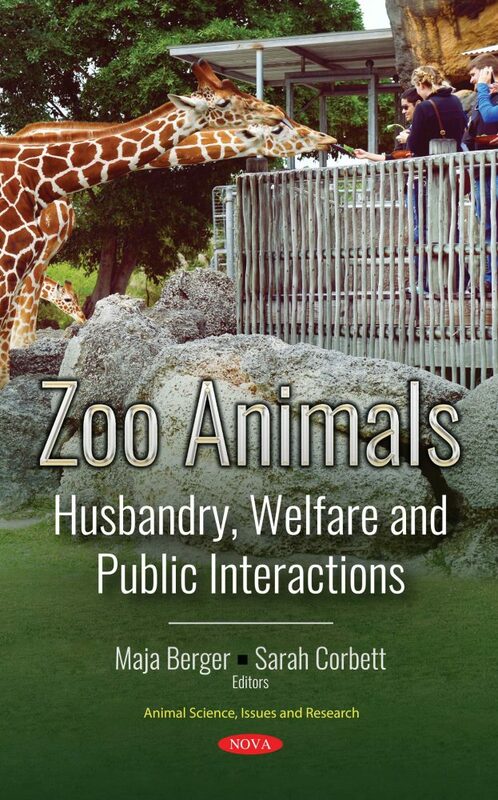 The opening chapter concludes by outlining areas for further research into factors that may affect the social compatibility of zoo-housed animals, and discusses the potential long-term implications for housing socially complex animals. Next, the authors explore the evidence surrounding the use of ambassador animals in zoo education programmes. The reported impact of ambassador animal programmes on zoo visitors in terms of visitor learning, attitude, and behaviours are reviewed, and areas for further research are highlighted. The subsequent chapter covers how quality of life can be measured and evaluated in the zoo. It will also discuss aspects of welfare compromise, and how research into species’ behaviour allows us to rectify issues that may cause a poorer quality of life. The use of natural history information (e.g. behavioural ecology, evolutionary adaptations, and life history strategy) to the planning, design and implementation of husbandry protocols is explained and reviewed. Later, the authors suggest that if zoos are to improve their effectiveness at conservation they should consider the application of cognitive enrichment, a type of occupational enrichment where significant cognitive challenge is provisioned over a protracted timeframe to ensure cognitive enrichment remains. Learning is considered the key to improving both individual welfare and species or population conservation. Afterwards, several key examples of folklore husbandry that may currently be impacting captive management in zoos are examined, focusing particularly on the provision of environmental parameters and elements of exhibit design. These keeping practices are interpreted and evaluated in light of current biological and captive management studies to identify and address areas of husbandry that can be improved upon. In the closing chapter, the authors suggest that if zoo managers know little about the biology and ecology of a species, it is unlikely they are able to provide them with captive conditions that represent optimal welfare. Although zoos are now more committed to research than they were in the past, the research they have undertaken so far has mostly been focussed on a few taxa, which represents a small proportion of the diverse collection of species kept by them. Chapter 4. Conserving Behaviour with Cognitive Enrichment: A New Frontier for Zoo Animal Management?